The article below mentioned USD55,000 but the official way marker bridge plaque only mentioned USD44,000 as the winning bid for President Woodrow Wilson’s rooster auctioned towards the construction of Rooster Bridge at Demopolis, Alabama. The year was 1919 and the Demopolis City Park was the place designated for the sale of roosters to help finance the construction of a bridge across the Tombigbee River into Sumter County. Frank Derby, of York, thought up the idea of selling roosters to help the State Department in building a bridge across the Tombigbee River. In 1919 Alabama Governor Thomas Kilby appointed a delegation to go to Washington to receive from President Wilson four roosters shown in the photo. Derby is the man holding the platter with the rooster on it. Some of the delegates locally were from York, Frank Derby, Thomas Cobb and H. J. Wallace. From Demopolis – James C. Webb and L. K. Simmons. Each person had to pay $10.00 to enter a rooster in the sale. The four roosters in the photo are from President Woodrow Wilson, Prime Minister Lloyd George of England, Premier Clemenceau of France and Premier Orlando of Italy. The roosters were sent to Demopolis where a huge amphitheater was built in the park for the staging of the sale. Over 900 roosters were sold. President Woodrow Wilson’s rooster sold for the astronomical price of $55,000.00 which was big money back then. The Montgomery group that bid for President Wilson’s rooster never paid the pledge. The attendance of President Wilson has been the only time that a president has visited Marengo County. One account of the day says that Helen Keller sent a rooster that sold for $5,000.00. Another says that she sent a “little blue hen” that sold for $15,000.00. There were three special trains to bring the thousands of guests, including the entire state legislature. Around a centrally located fountain within the square, stadium-style seating for 10,000 was erected specifically for the event and disassembled afterward. Half of the park was said to have been covered in chicken coops. Roosters were not the only items up for sale that day – a case of Ferraline Wonder Remedy made from mineral water that dripped from the Demopolis cliffs, a bull and a billy goat were also on the auction block. In conjunction with the auction, the state’s largest barbecue was held on the riverbank behind Trinity Episcopal Church. The donated meats and other food provided $22,000.00 in profits. The Shriner and Marine Bands served as live entertainment. No one knows how much money was made by the birds because of the records not being kept very well and a great deal of the money was never paid after the bids had been made. About $45,000.00 was turned over to the State Department after the heavy expenses of the sale. The bridge was opened May 15, 1925. It was 988 feet long and constructed by a firm out of New Orleans. There is a monument in front of the Demopolis City Hall that honors the event. Here in the park in downtown Demopolis was constructed a huge amphitheater for the staging of the sale. Thousands of spectators were able to observe the colorful goings-on. A huge barbecue was served nearby. 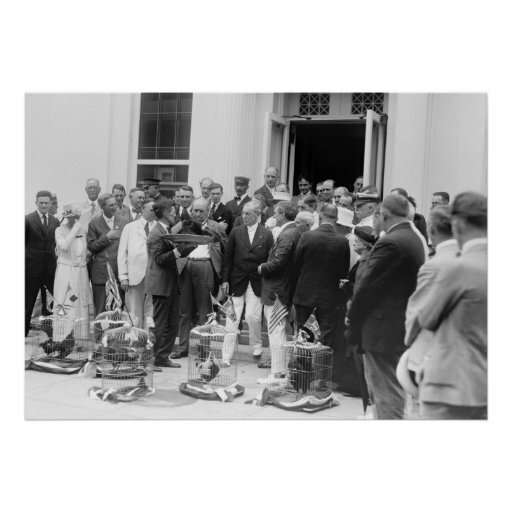 An accompanying photo shows “the Alabama Good Roads-Rooster Party” during a visit with President Wilson at the White House. The caption notes that President Wilson can be easily picked out, but for those who may not be able to pick him out easily, he’s standing on Rear Admiral Benson’s right. 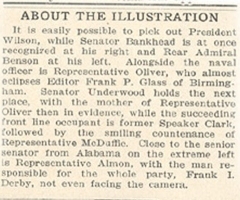 The caption adds that Senator Bankhead “is at once recognized at his right,” referring of course to the President’s right. Almost all other participants are identified (including Mr. Derby), but the caption makes no reference to the four roosters caged in front of the assembled crowd. They are, indeed, the illustrious roosters donated by their famous owners to the cause of Good Roads. The “Rooster Bridge,” as it was known, served traffic on the Dixie Overland Highway and U.S. 80 until 1980, when it was demolished and replaced by a bridge on new location. A second parallel bridge will soon be built at the new location. These figures, however, were on paper only. An article in The Demopolis Times stated, “In all the excitement, proper records of some of the purchasers and their bids were not made and a great deal of money was never paid. Even the bidder who won “Woodrow” neglected to pay for his rooster. In all, the effort raised only $45,000 for the bridge. As a result, construction was delayed until 1922.